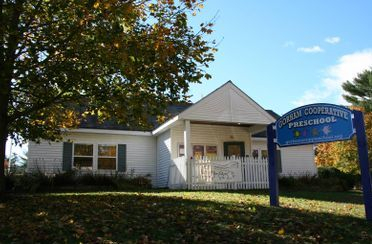 Gorham Cooperative Preschool in Gorham Maine 28 Ball Park Rd. 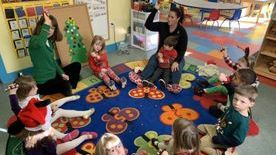 Gorham Cooperative Preschool, or GCP is an independent, non-profit organization serving children ages 3-5 from Gorham, Maine and the surrounding communities. 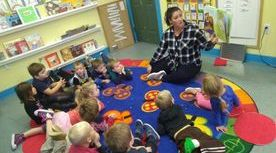 Our purpose is to foster, stimulate and encourage each child’s development emotionally, physically, socially and intellectually in an environment where their ideas and interests are valued. Every day we gather together on our oval rug and hang our names on the attendance board, reveal the share item, check the calendar, sing songs, play games and discuss small group activities. "Looking at the Week Ahead" is emailed weekly for families to feel prepared for the upcoming week or to steer the conversation when you're looking to talk with your preschooler! 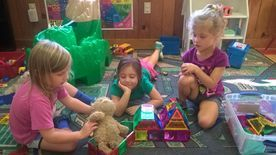 Children are given ample time to choose their own materials and activities. We believe that time spent playing is not just fun but also promotes growth, development and learning. 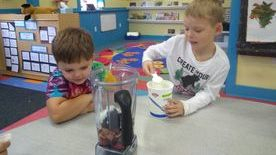 The classroom is a busy and lively place as children and adults interact, explore and have fun. Families are assigned specific days for volunteering in the classroom. Every day there is a volunteer who we call the parent helper but grandparents and other family members are welcome. Parent helpers lend an extra hand while spending quality time with their own child. 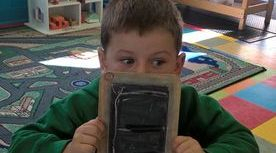 To better prepare children for the demands of kindergarten our school uses the Handwriting Without Tears program. This program uses child-friendly and well researched activities to help children learn and practice writing the letters of the alphabet. Reading to children is a priority at our school. Quality literature promotes comprehension, vocabulary and a lifelong love of books. Gathering the class together to hear a good story is an important part of our daily schedule.